What exactly are the Seahawks? Are they closer to the team that stumbled out to records of 0-2, 2-3, and 4-5? Or to the team that then reeled off four wins in a row and looked entirely ready to come into Santa Clara and claim a playoff berth on their lowly rivals’ home field? Or the team that promptly barfed up a chance to clinch on Sunday, losing not because of its efficient-as-ever offense, but because it couldn’t stop taking penalties? Seattle fell 26-23 in overtime to the Niners, a sloppy loss that saw breakdowns in pass coverage, a botched kickoff coverage, a missed extra point, and 14 penalties—10 after halftime—for 148 yards, a franchise record. Offensive penalties sabotaged the Seahawks’ final three possessions, but it was a controversial defensive pass interference call on CB Shaquill Griffin in OT that sealed things going the other way. Griffin was in coverage on Dante Pettis and appeared to bat away the ball cleanly, but he was flagged for DPI. Instead of facing a third-and-15 from their own 44, the Niners had a new set of downs from Seattle’s 41, and would kick the game-winning field goal four plays later. “A terrible call,” Griffin complained later. Making it all the worse, Griffin said he had been hypervigilant of how tightly the officials had been calling the game, and specifically tried not to draw a flag. 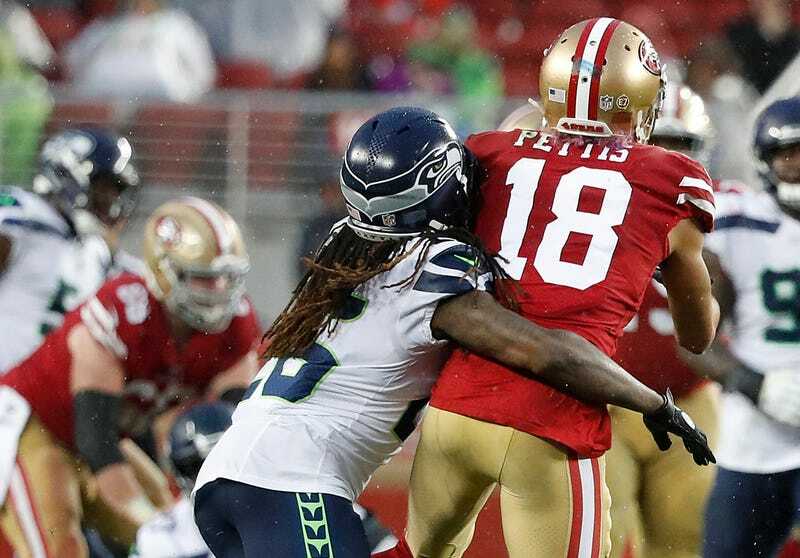 It was, perhaps, a classic trap game for the Seahawks, though to a man they all denied taking the Niners lightly. There are no more potential trap games left. Next week they’re home in primetime against the Chiefs, who because of their own loss this week, will need a win to wrap up the AFC’s top seed. If Seattle loses that one, they’ll be home in Week 17 against the truly putrid Cardinals, likely needing a win to make the postseason. So they’ll probably be in, one way or another. But what about after that?